Kyiv, December 27, 2014 – «Another piece of Ukrainian land is now free from the Russian occupants. Yesterday Russian border troops have abandoned their positions in Kherson oblast on the Chongar peninsula and withdrawn behind the administrative border of Kherson oblast with the AR of Crimea. The State Border Service of Ukraine took this area under control”, said Colonel Andriy Lysenko, ATO spokesman, during the briefing in the Ukrainian Crisis Media Center. Ukraine welcomes its heroes released from the captivity. Yesterday evening, at the demarcation line in Donetsk oblast Ukrainian special services have liberated 146 Ukrainian soldiers from the captivity. These are servicemen from different units of the Armed Forces of Ukraine, the National Guard, Myrotvorets and Donbas battalions, other volunteer battalions and some (logistics) volunteers who were helping the army; these people had been held captive for different periods, from several weeks to several months. «The full list is disclosed at the SSU website. This night at Vasylkiv airfield the President of Ukraine Petro Poroshenko saluted the Ukrainian Air Forces plane bringing the released Ukrainian heroes back. “The Head of the State welcomed the released warriors on the Ukrainian land and expressed his respect and reverence to their heroism”, Colonel Lysenko added. Within the framework of the negotiation process the terrorists take counter-productive stance, procrastinate with the negotiations, resort to occasional provocations. Meanwhile, the terrorist units are being staffed up, stock of weapons, military equipment, ammunition and inventories imported from Russian Federation is being accumulated. The enemy continues to develop its infrastructure, field hospitals are being deployed in the vicinity of the demarcation area. 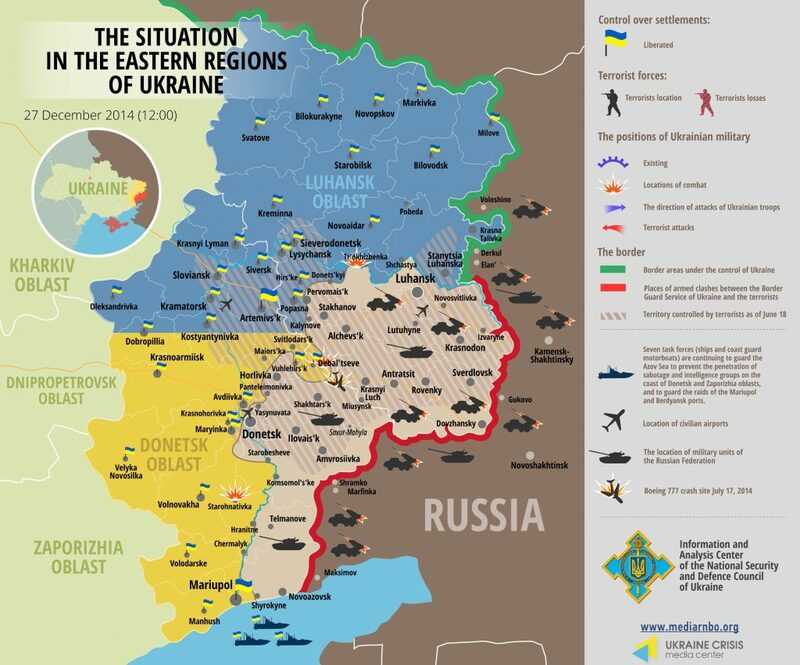 Armed provocations against Ukrainian armed forces continue, in particular, on Donetsk and Luhansk directions. However, heavy weapons engagement was not observed. During the last 24 hours 3 Ukrainian soldiers were wounded, there were no casualties. Border guards again recorded the terrorists using drones for aerial reconnaissance. A drone was noticed up to 1 km high along Sartana-Mariupol line. Yesterday in the entry-exit checkpoint near Makarove village the humanitarian cargo was dispatched from the Ukrainian Office of the Red Cross. 7 trucks carried 25 tons of food, hygienic and household goods for the Luhansk oblast residents.